The future USS John Finn (DDG 113) was launched at the Huntington Ingalls Industries (HII) shipyard March 28. During launch the drydock was flooded allowing the 637-foot floating dock to slowly submerge until the ship was afloat. Once the drydock was fully submerged, the ship was pulled by tugs to HII's south berth where the ship will continue outfitting in preparation for test and activation and eventual delivery to the Navy. The next major milestone is the ship's Aegis system light off planned for later this year. "This is the first DDG 51 class ship to launch in almost four years and we're both proud and excited with the progress the program is making," said Capt. Mark Vandroff, DDG 51 class program manager, Program Executive Office (PEO) Ships. "I look forward to John Finn joining the fleet and the other ships of her class to continue in the legacy of success that is the Arleigh Burke destroyer." John Finn is the 63rd Arleigh Burke (DDG 51) class destroyer, and the first of the DDG 51 Flight IIA restart ships. HII currently has three DDG 51 destroyers under construction at the yard and an additional four under contract. The keel of DDG 113 was laid in November 2013, and the christening ceremony is planned for May 2. 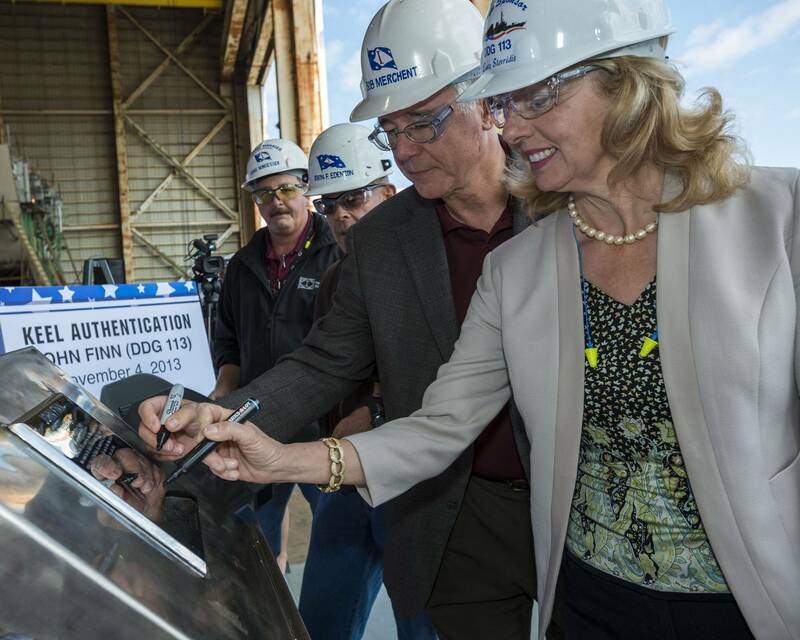 "DDG 51 production is in full swing at the shipyard," said Vandroff. 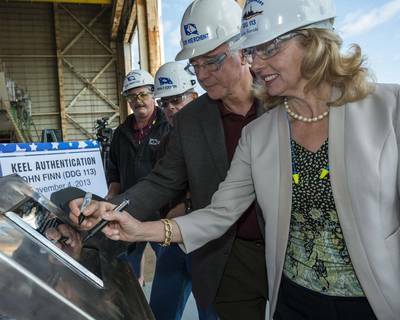 "The Navy and shipbuilder are working closely together to ensure continued quality and value as production continues on the restart ships." John Finn will be equipped with the Navy's Aegis Combat System, the world's foremost integrated naval weapons system. Once operational, the multi-mission surface combatant will serve as an integral player in global maritime security, engaging in air, undersea, surface, strike and ballistic missile defense. DDG 51 Flight IIA ships will provide increased capabilities over previous flights of Arleigh Burke destroyers, including advances in anti-submarine warfare, command and control, and anti-surface warfare.